Since it was launched more than half a century ago, the OMEGA Speedmaster has defined the classic chronograph. It is rugged and reliable and has a timeless design. And since the day in July 1969 that it was first worn on the lunar surface, it has been known by its nickname, the Moonwatch. This Christmas, an innovative new member of the family is being introduced, equipped with the OMEGA Co-Axial caliber 9301 – the Speedmaster OMEGA Co-Axial Chronograph. While it shares some core elements with the original Speedmaster Professional – the black dial, the Moonwatch-style hands and the familiar tachymeter on the bezel – it also has some distinguishing features that will attract an even wider audience to the world’s favourite chronograph. 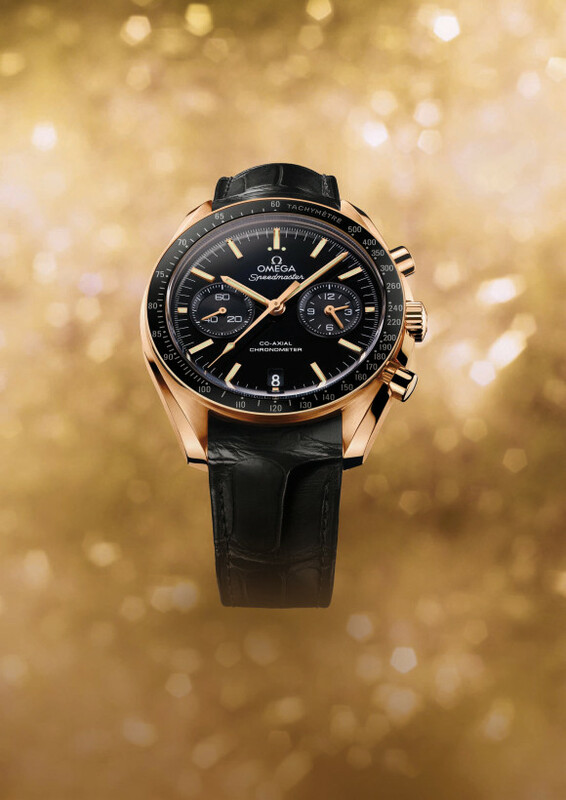 The Speedmaster OMEGA Co-Axial Chronograph featured here has a 44.25 mm case in 18 Ct orange gold and a dramatic black ceramic bezel with a contrasting metallic grey tachymetric scale. With this watch, OMEGA has introduced its striking new 18 Ct orange gold whose elemental composition contributes to its unique colour and its high level of hardness.Like all of the gold used in OMEGA’s products, orange gold is 18 Ct, meaning that the metal is composed of 75% gold. It has a high copper content (23.98%) which contributes to its vivid colour. The remaining 1.02% is divided evenly between platinum and silver. The platinum enhances both the hardness of the material and the value of the precious metal. The fact that platinum doesn’t oxidise acts to stabilize the red colour. 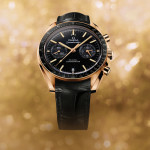 The Speedmaster OMEGA Co-Axial Chronograph has a black enamel dial with 18 Ct orange gold transferred elements and hands. It is offered on a black leather strap. It is equipped with the OMEGA Co-Axial caliber 9301 and thanks to its Co-Axial escapement and free sprung-balance, the chronograph will deliver outstanding reliability over a long period of time. The innovative column-wheel chronograph has 12-hour and 60-minute counter hands placed on the same subdial at 3 o’clock. This familiar arrangement of the hands, which recalls the hour and minute hands on the main dial, enables intuitive reading of the chronograph. It also has a central chronograph seconds hand and a small seconds hand on the sub-dial at 9 o’clock. The two chronograph control pushers function totally independently – accordingly, there is no risk to the chronograph mechanism as a result of inadvertent manipulation. Like OMEGA’s other in-house Co-Axial movements, the caliber 9300/9301 features a decorative pattern known as “Côtes de Genève in Arabesque”. It is also equipped with a silicon balance spring. Silicon is non-magnetic so it is not influenced by magnetic fields. This quality combined with the excellent resilient coefficient of silicon allows the balance springs, which are etched on a silicon wafer, to deliver improved chronometric performance. Silicon also has a very low fatigue influence and ages slowly. The outstanding reliability delivered by the combination of Co-Axial technology and the silicon balance spring is such that OMEGA delivers its Co-Axial watches equipped with silicon balance springs with a full four-year warranty. 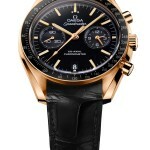 The Speedmaster OMEGA Co-Axial Chronograph is a welcome addition to the great Speedmaster family. With its 18 Ct orange gold case, its innovative movement and its legendary family name, it will find an enthusiastic following among Speedmaster fans who want to combine the impressive legacy of an iconic chronograph with the best series-produced mechanical watch movement in the world. This entry was posted in Press Release, Speedmaster Automatic and tagged 311.63.44.51.01.001, Co-Axial, Speedmaster 9300 on December 6, 2011 by Dale Vito.